← Is life in the garden less dangerous? 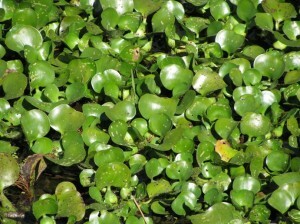 Water hyacinth, Eichornia crassipes, is known as the world’s worst aquatic weed because of its prolific growth. It lowers biodiversity in tropical waterways, shelters pests like mosquitos, and causes eutrophication. But all that biomass could have its uses. Patel summarizes research on using water hyacinth in wastewater treatment, production of biofuels, animal feed and many other uses. This entry was posted in Eichornia crassipes and tagged Eichornia crassipes, water hyacinth. Bookmark the permalink.